jumpstart your joy with ready made Word Art! Sure they're designed to coordinate with the LEMON SQUEEZY page kit, but you can be sure these page toppers will play well with tons of goodies in your stash! What are they? Well- think of them as "instant lemonade" for your layouts! Each of the six Word Art files come as a pre-clustered form: they are layered, shadowed and merged as a png file, so all you have to do is place it on your page and you've got a title or journal prompt ready to go! *please note,the emeblishments and paint can not be seperated from the words. Each cluster is one .png file. This file soes not include papers. And as a bonus- the words are provided without embelishment in png format you you can embelish as you'd like. moral of the story: " If a designer gives you lemons- you can make an awesome layout!" *not all items are shown in preview. This item coordinates perfectly with the other May 2018 BYOC products! Drop shadows for illustration only. This digital kit has been saved as .png files at 300 dpi. Not all items shown. Personal Use Only please. lots of sweet lemony goodness like a painted lemon tree branch, a heart shaped lemon slice, a curl of zest, a lemon to make lemonade with, 3 lemon stamps and 3 lemon leaves, lemonade in a bottle and a vintage lemonade cap and a painted lemon wreath. 14 pieces of meaningful word art designed to prompt your pages including, felt letterboards, banner styled word art (one plain for you to write on!) , veneer styles and velum styles plus and additional 10 rubber styled worn snips. 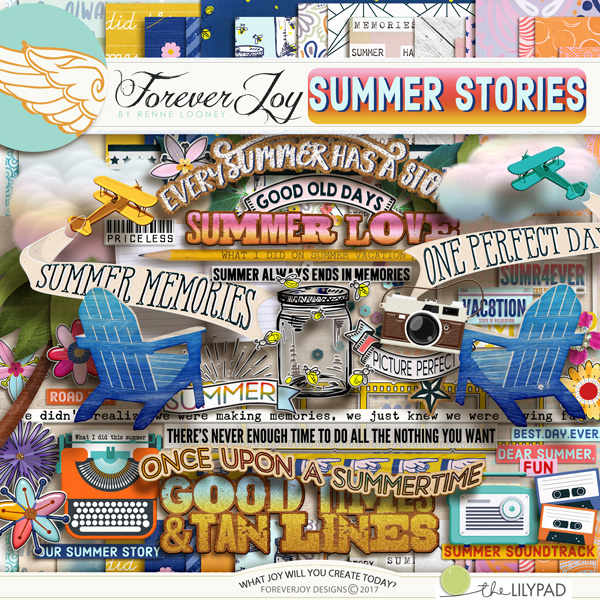 "Summer always ends with memories" Capture yours with this sunset colored collection full of pretties and Word Art designed to help you capture all those sunny moments of that magical time when time slows down called summer vacation! Here's what's packed inside:18 patterned papers + 5 bonus solid papers and a unique collection of pretties including: 5 banners, 2 flying airplanes, a camera to capture all those moments, 2 puffy clouds colred by the sunset, a little bow, a scatter of fireflies, a jar to catch them in- or to collect your summer memories!, 3 paper flowers and 6 handrawn puffy sticker flowers, polaroid frames, a blank journal to fill with moments to remember, a pencil, 2 beach chairs to kick back on, 2 radios to listen to your top summer tunes on and a few mix tapes to lable with your favorite songs, 3 leaves, a film strip to fill with photos, a paint smudge and painted chevrons, a veneer palm tree, 2 vanity plates, a scattering of sequins, 2 cork stamped stars, 7 snippets, 3 strips of washi, a curl of string, a typewriter to write your summer story on, and 13 pieces of Word Art designed to prompt you to tell exactly what you did on summer vacation! 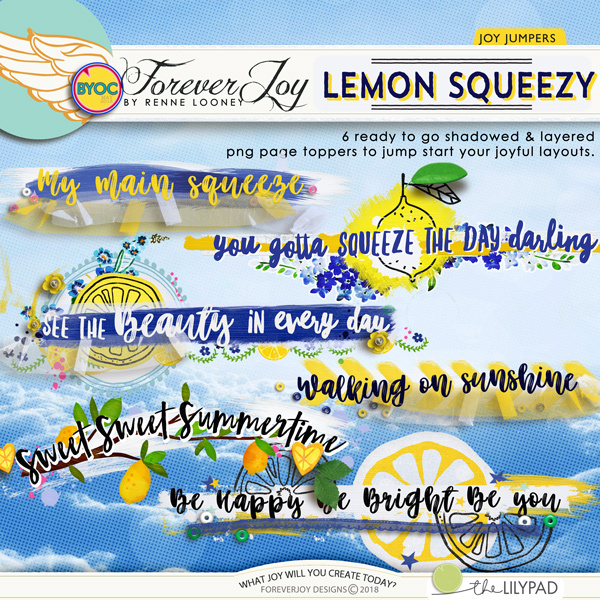 "Summer always ends with memories" Capture yours with this sunset colored collection by ForeverJoy! 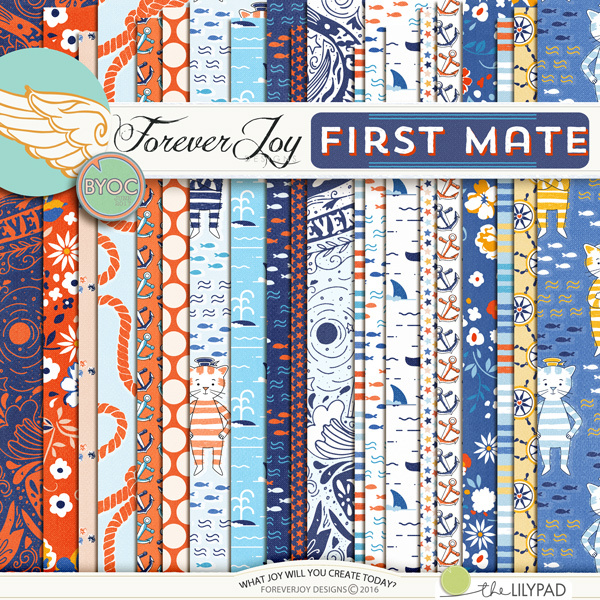 This paper pack contains includes 18 patterned papers (and 5 bonus solids!) The previews show the papers swimming alongside the POOLSIDE pretties- and both can be purchased together here as a kit. Drop shadows for illustration only. This digital kit has been saved as .jpg files at 300 dpi. Not all items shown. Personal Use Only please. "Why limit Happy to an hour?" 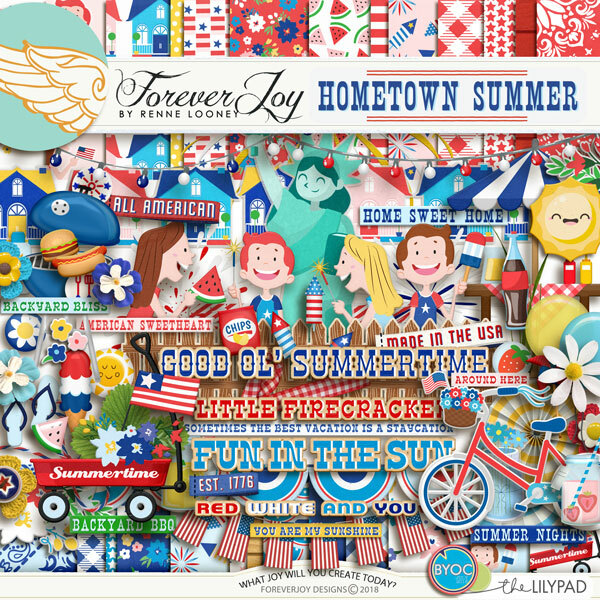 Enjoy both the papers and pretties in this Page Kit! Inside you will find 19 papers, 7 bonus solids, and a collection of pretties that includes two pieces of mylar balloon Word Art to get the party started, 3 hanging party lights, a string of colored lights, a tassle banner colored 2 ways, a Hula Girl, a ukele to jam on, 4 brads, 2 cool flamingos, a scattering of colored beads, a collection of top shelf tropical drinks, 3 felt flowers and 3 florwer stickers, various rubber dots, 2 popsicles (because the kids have to keep cool too! 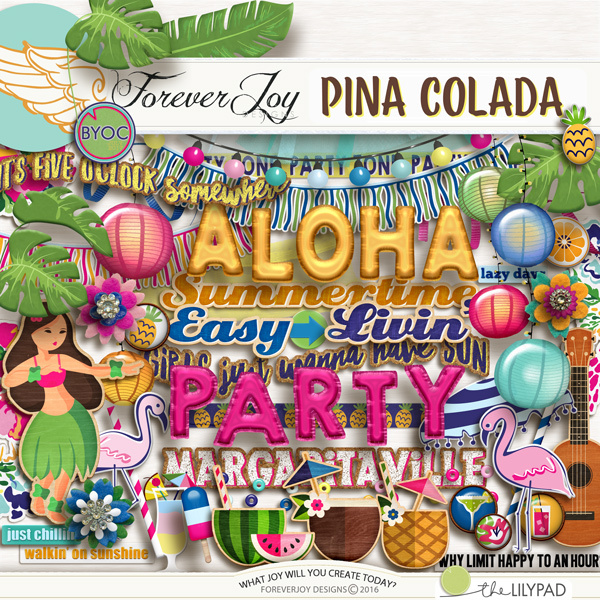 ), 3 chipboard tropical leaves, journal lables, a slice of lemon, watermelon and a sweet pineapple, 2 pieces of tulle, 2 curls of ribbon, colred straws, a beach umbrella, 3 strips of Washi tape and 10 pieces of Word Art- *not all items are shown in preview. This item coordinates perfectly with the other JULY 2017 BYOC products! Drop shadows for illustration only. This digital kit has been saved as .png files at 300 dpi. Not all items shown. Personal Use Only please. This collection of pretties includes two pieces of mylar balloon Word Art to get the party started, 3 hanging party lights, a string of colored lights, a tassle banner colored 2 ways, a Hula Girl, a ukele to jam on, 4 brads, 2 cool flamingos, a scattering of colored beads, a collection of top shelf tropical drinks, 3 felt flowers and 3 florwer stickers, various rubber dots, 2 popsicles (because the kids have to keep cool too! ), 3 chipboard tropical leaves, journal lables, a slice of lemon, watermelon and a sweet pineapple, 2 pieces of tulle, 2 curls of ribbon, colred straws, a beach umbrella, 3 strips of Washi tape and 10 pieces of Word Art- *not all items are shown in preview. This item coordinates perfectly with the other JULY 2017 BYOC products! Drop shadows for illustration only. This digital kit has been saved as .png files at 300 dpi. Not all items shown. Personal Use Only please. How about a dip in the creative end of the pool? 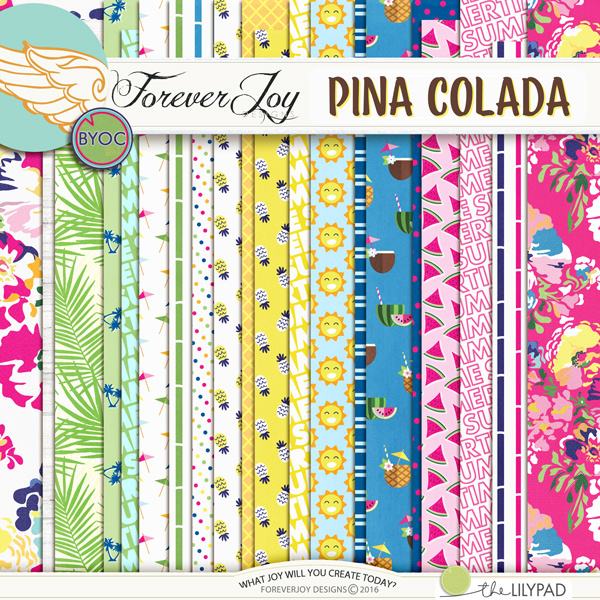 This paper pack contains includes 22 patterned papers (and 5 bonus solids!) The previews show the papers swimming alongside the POOLSIDE pretties- and both can be purchased together here as a kit. Drop shadows for illustration only. This digital kit has been saved as .jpg files at 300 dpi. Not all items shown. Personal Use Only please. 22 patterned papers + 5 bonus solid papers and an awesome collection of pretties including: 3 floaties (a unicorn, a duck and a cool flamingo) , 2 swim rings, 2 beach balls, 4 various splashes of water, 6 brads, 1 bow, a curl of string, a pool chair charm, a chillaxin' gal sticker, 2 summer drinks, 2 cork spots, 2 paper fan flowers, a school of fish, 2 chipboard hibiscus flowers, 2 paper flowers, 2 tropical styled leaves, heart shaped sunnies, sunscreen (because you can't forget the sunscreen! ), a swim mask, flip flops, a little enamel sun pin, a "no splashing" pin for when you want to keep things low key, water bubbles, 3 strips of washi tape and 18 pices of Word Art designed to prompt the cool side of your poolside photo stories! *not all items are shown in preview. Drop shadows for illustration only. This digital kit has been saved as .png files at 300 dpi. Not all items shown. Personal Use Only please. "Not all treasure is silver and gold.."
Ahoy mate! let your creativity set sail with the FIRST MATE page kit! Inside is a treasure of 15 patterned papers, 5 bonus solids and a treasure full of pretties including: 1 felt banner, 2 word art banners, a scattering of beads, a silver boat charm, a family of sailors with captain and first mate included!, 2 buttons, a little pirate crab and starfish sticker, a wood sword, an eye patch and pirate hat, a school of fish, a feathery fern and branch of leaves, 5 flairs, 2 fish, 4 flowers and 2 flower stickers, gold coins, a treasure chest, a palm tree, a desserted island to play on, a path to treasure, an X to mark the spot, a seashell and a starfish, a spyglass, 2 curls of string, and 17 pieces of Word Art. *not all items are shown in preview. This item coordinates perfectly with the other JUNE 2017 BYOC products! Drop shadows for illustration only. This digital kit has been saved as .png files at 300 dpi. Not all items shown. Personal Use Only please. This collection of pretties includes 1 felt banner, 2 word art banners, a scattering of beads, a silver boat charm, a family of sailors with captain and first mate included!, 2 buttons, a little pirate crab and starfish sticker, a wood sword, an eye patch and pirate hat, a school of fish, a feathery fern and branch of leaves, 5 flairs, 2 fish, 4 flowers and 2 flower stickers, gold coins, a treasure chest, a palm tree, a desserted island to play on, a path to treasure, an X to mark the spot, a seashell and a starfish, a spyglass, 2 curls of string, and 17 pieces of Word Art. *not all items are shown in preview. This item coordinates perfectly with the other JUNE 2017 BYOC products! Drop shadows for illustration only. This digital kit has been saved as .png files at 300 dpi. Not all items shown. Personal Use Only please. "Not all treasure is silver and gold..."